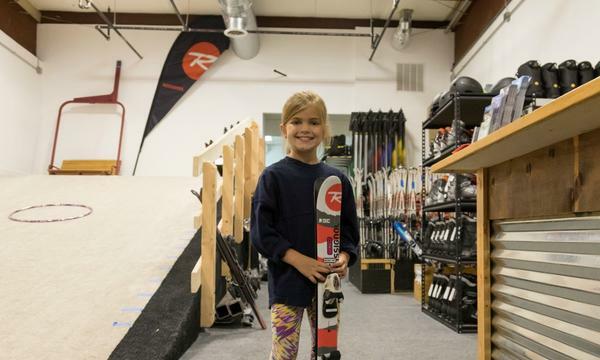 Join Inside Ski in Leesburg, Va this summer for their 1-Hour Group Ski or Snowboard lessons - they'll have you ready for the slopes without the hassle of lines, lifts and cold weather! Each one hour session includes three (3) ten minute non-stop sessions on the "shred-mill" for experienced skiers or boarders. No equipment necessary - Inside Ski provides all the gear you need for every age and level participant out there. Just show up, get fitted properly for boots by their professional staff, clip on your gear and you're ready to go! Or, if you have your own helmet (bike, skateboard or snow), and boots, please bring them! All instructors are PSIA / AASI ski and snowboard certified and work in-season at either Liberty or Whitetail ski resorts. At Inside Ski, enjoy fast-paced, individualized learning with immediate feedback. Here's how it works: Once you're geared up, you'll step onto an upward revolving surface that simulates a slope sliding underneath you. Instructors control the pitch and speed of this supersized treadmill, tailoring it to the ability of the skiers or boarders on the slope. Novice skiers have the added benefit of a padded support bar at the bottom of the slope to provide stability while advanced skiers can use the large mirror at the bottom of the slope to see their skills improve first-hand. If you've NEVER skied or snowboarded before, no worries! Your instructor will start you on the static (non-moving) deck first and teach you all the basics. Depending on your progress, the instructor will transition you to the revolving slope for a 10 minute session. Don't think of this as a new way to ski or snowboard - think of it as a way to enhance your experience. With Inside Ski Training, you'll save time and money. Each session offers the same training as a half day on the snow. By training in the off-season, you'll be ready to hit the slopes with confidence and ease when the first snow falls this winter. Group lessons are limited to 3 participants. If you have more than 3 participants, you need to book an additional hour(s). Please note all rescheduled lessons still must be completed by September 30, 2019. Multiple vouchers may be purchased and redeemed. Cannot be combined with any other special offers, promotions or discounts. Not valid on prior lesson enrollments. Merchant cancellation policy applies. This very special deal is non-refundable. Vendor is responsible for the quality of the products or services provided at redemption.